So now that spring has sprung in Vancouver and all of the various pathogens with which I’ve been infected appear to have left the building, I’ve gotten back into the swing of things running-wise. I’m really, really slow from having taken so much time off from running1, but I’m confident that if I keep getting out there, the speed will eventually return. I met up with my BMO Marathon Relay teammates for brunch on Saturday to discuss logistics, and I’m really looking forward to that event, which a mere 20 days from now! Fortunately, I’m training for the Scotiabank Half Marathon and the 13 km I will need to run for my leg of the relay is in line with my training plan2. 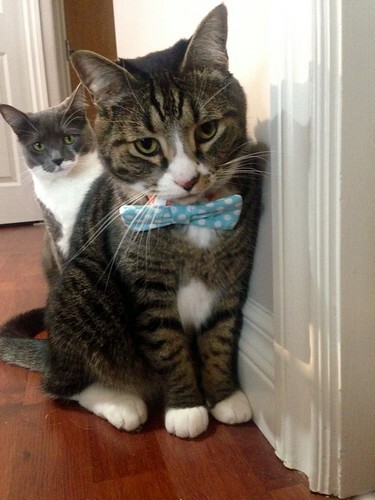 love your web site and your cats with the bow tie….. you should post the cats with a different bow tie every day… they are so cute and formal….